0700hrs 28 June 1944: C company of the 3rd Monmouths (part of 159th Brigade, 11th Armoured Division) had spent the night in the French town of Bas de Mouen after getting lost in the dark. Unknown to them their small unit lay right in the path of a major German counter-attack made up of crack troops and tanks from the Leibstandarte division operating as part of Kampfgruppe Frey. Most games in Scottish Corridor will be using fresh troops, on the German side that means a near full strength Panzergrenadier platoon (9 men per squad) while the British have a full infantry platoon. Kampfgruppe Frey and Weidinger are poised on the flanks of the Scottish Corridor, with Frey making the first probe from the east in this game. The orchards south of the road provide good cover, and the hedgerows and farm walls turn the main road into a choke point. North of the road the fields allow little cover, but quick movement and better fields of fire for support weapons. British patrols focused on gaining ground in the wooded orchard side of the road, and trying to grab the crossroads, while the Germans spread out from their starting point and advanced on a broader front. 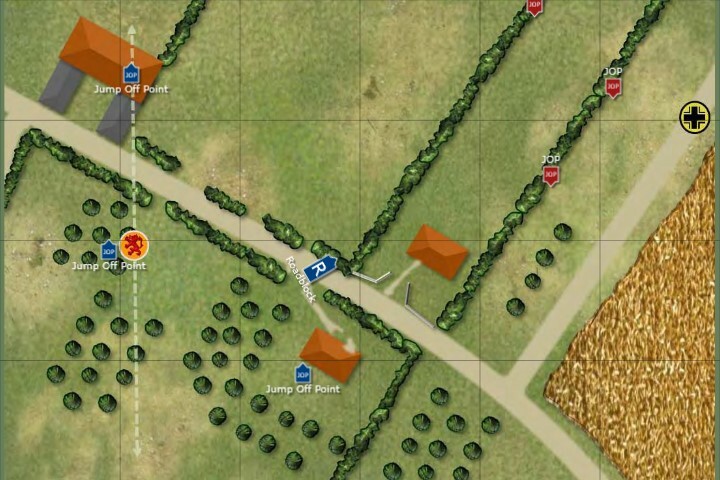 German jump off points ended up clustered around the hedges near the road their column was advancing along, while the British had a forward outpost at a house in the orchards, with another in the house overlooking the fields, with a centrally located one linking them. The British placed a roadblock near their forward outpost, clearly hoping that and the threat of a PIAT bomb from the hedges would make German armour think twice about a cheeky thrust down the road. We both rolled poorly for Force Morale, with the British on 8 and the Germans on 9. The German plan was pretty simple. Since Phil knew the British didn’t have much that stood a chance against the Tiger the plan was for that to drive through the British position, with the infantry supporting it. A burnt out CMP truck being used as a roadblock. A Tiger could crush this like a tin can, but how does it know that it’s not mined? Of course, as you’ll see in a minute neither of these plans lasted contact with the enemy. Phil kicked off the game by rolling a double phase on his first set of command dice, at which point his Plan A went out the window in favour of a hastily improvised Plan B. In a probe game the only victory condition is to reach the enemy’s table edge, and the temptation to make a quick dash down the table was too much to resist. Personally I think I’d have done the same, sometimes you’ve got to willing to chuck your plan out and seize and opportunity! So instead of getting the Tiger on letting it take the lead, a squad of panzergrenadiers deployed straight into one of the open fields and on their second activation they sprinted across the field towards the hedge on the other side. I was really hoping for a triple one on the dice, but Phil’s hot dice continued and he rolled a triple six instead, taking them right across the field to the hedge on the far side. The British really couldn’t afford to let the Germans make so much ground so quickly, so I deployed a section and my platoon commander from the JOP in the house just in front of the Germans. This was a point-blank do-or-die deployment, and they’d be going straight into hand-to-hand action! The rules aren’t totally clear on how this works, we decided that the British definitely didn’t count as moving, and gave both sides the benefit of defending light cover, as the action was taking place on either side of the hedge, and the situation didn’t really suit the normal attacker/defender concept of a normal close combat. Totting up the dice we came to a frightening 26 dice each. The German roll wasn’t great, but managed to kill four squaddies and wound the officer. The British result was absolutely savage, scoring eleven kills and wiping the German squad out (this was the first British phase remember!). Luckily for Phil this was his support squad, so the losses wouldn’t affect his core platoon. The morale impact of all this was much more even, both sides losing two points (Germans now 7, British 6). …and the Jocks emerge triumphant, wiping their enemy out! Having done such a good job of cutting a German squad to ribbons my intention was to pull the survivors of that section back out of sight to recover, but the Germans were having none of it. Deploying another squad on the far side of the field and bringing up their Tiger, the combination of two MG42s and an 88 lobbing HE was enough to pin the mauled British section were it was. Unable to get them out of trouble (and worryingly with the SL still attached) I tried to rally off some shock and return fire a little, but the effect was pretty poor and after exchanging some fire in a very one-sided firefight the section was quickly reduced to two squaddies and a wounded JL with a ton of shock on them, and they promptly broke and fell back behind the nearby farmhouse. To be honest, that was actually a result I welcomed, as it was the only way they could get out of the line of fire. The only slight complication was that the platoon commander was still with them, so was at risk of routing off table if anybody rolled a turn end. The big boy rolls onto the table. This is actually the first time we’ve had a Tiger on table in CoC. Briefly a relative calm descended over the countryside. Nobody was shooting, but there was plenty of shouting coming from the German end of the table, and the roar of a big Maybach engine meant the Tiger was on the move, crossing the road and moving up in support of the infantry attack. On the British side the only action was scrubbing some shock off the battered section licking its wounds behind the farmhouse. However, the dice gods were again about to influence the German plan, and another double phase popped up. With a tank and a squad already on table covering the fields Phil decided to try his luck again and deployed another squad into the open ground and sent them sprinting across the field. They weren’t as nippy as the previous lot, perhaps slightly unnerved by the piles of grey-uniformed bodies they were running towards, and they ended their turn still only half way across the field. Again, this was too close to the British baseline to go unanswered, and too good an opportunity to cut up the German infantry to ignore. I deployed a fresh rifle section into the hedgeline and opened up on the Germans in the open. Some great shooting saw them wipe out one of the two teams in the first volley, and the Scharfuhrer commanding the squad went down wounded, too. This was about as good a result as I could have expected, and my plan was to pull back from the hedge and out of sight as soon as possible, so I deployed my third and last section through one of my other JOPs, with the intention of moving them up onto the road where they could cover the Field of Death from the flank (and therefore hopefully out of the line of fire of the Tiger, at least for now). The Germans would get some shots off before I could do that, though, and some excellent shooting from MGs and HE lobbed in by the Tiger saw the British section quickly pinned. Their JL had also been wounded, which chopped British morale down to a very wobbly two points and saw the loss of the JOP in the nearby farmhouse. The fresh British section was struggling to get into position now, and doubled onto the road ready to take up firing positions next phase. The Germans traded fire with the pinned section, and some surprisingly good shooting from the Brits saw the German JL killed and the remaining MG team stuck in the open become pinned. This chipped away at German force morale further, they had tracked just ahead of British all game and now slumped to three, cutting their command dice. Things were starting to look pretty dicey for both sides, but one thing the Germans had in spades was CoC dice. Despite the game being quite young they’d managed to accumulate dice quickly due to some fantastic command dice rolling and their campaign special rule allowing them to convert the normally frustrating lonely six into a pip on a CoC dice. Phil is a big fan of ambushes and played one now, deploying an MG team from one of his off-table squads into the field right in front of the be-leagued British section. Endgame. 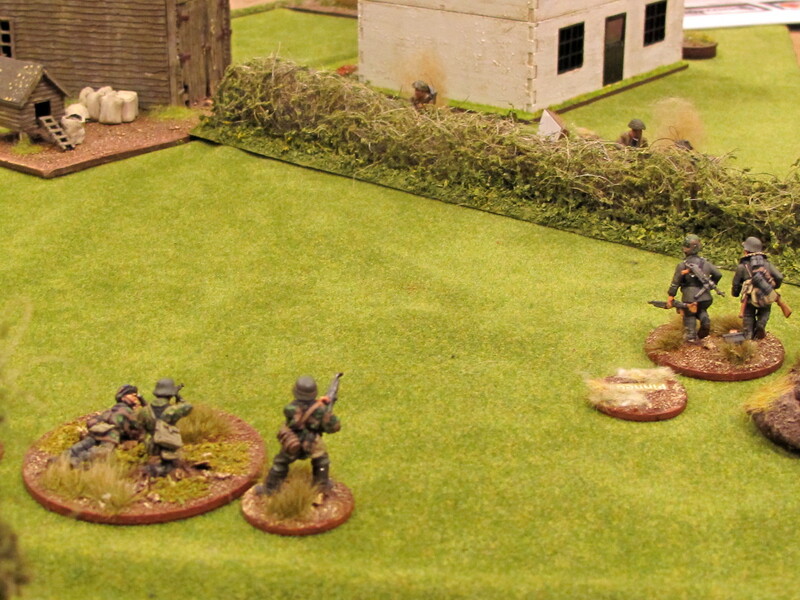 The Germans deploy another LMG team as an ambush, and it savages the remaining British troops in front of it. There weren’t a lot of Brits to shoot at by now, and a volley of horrendously accurate MG fire saw the Brits lose a team, have their JL hit and the other team break. The British only had two points in their force morale bank account, so even with burning a CoC dice to avoid one of the morale tests it was enough for British morale to crash to zero and see the force rout. Kampfgruppe Frey had head butted their way through the British line in absolutely brutal fashion! Probe games aren’t normally anywhere near this bloody. This was a quick and brutal game (we were done in about an hour and half, tops). 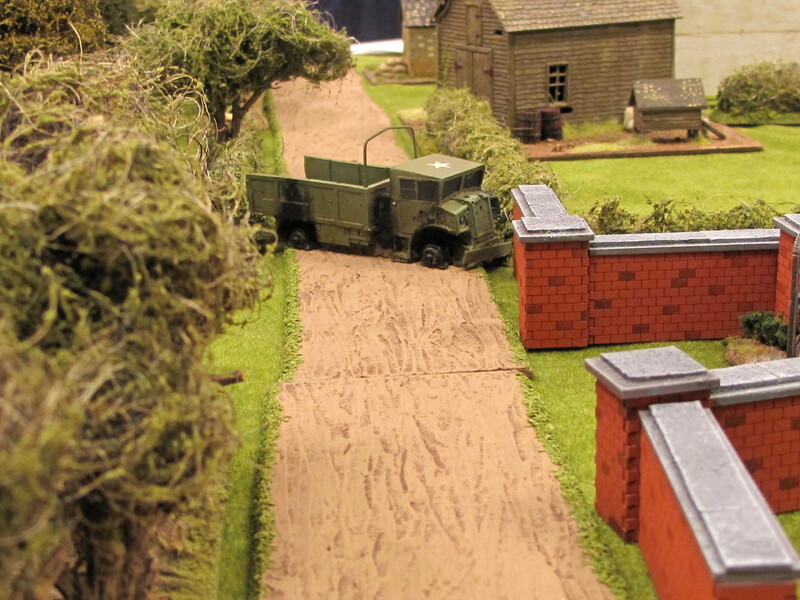 The Germans had lost their whole support squad, and one squad from the core platoon had lost their JL and four men. They’d ended the game with a three-point morale advantage though, which reduced their permanent casualties down to one soldier and the JL. Both sides had taken 14 men off table in the game but the British were all from the core platoon. Luckily in this campaign the Brits get a fresh platoon each time fighting moves to a new table, otherwise they’d be swallowing seven dead, four wounded. Although it wouldn’t affect anything I rolled for their withdrawal and despite the shambolic state of their position only one corporal was captured, with two more men becoming separated and the rest of the platoon withdrawing safely. Predictably the British CO was unimpressed, and his opinion now moves to -1. The men were unhappy about the heavy casualties and their opinion swoops to -2. I find rolling for changes to the platoon commander’s mood a bit weird in this campaign since it’s a different bloke in every game, so will be rolling for the next guy. I can see the CO and the men’s opinion transferring across the different platoons in the battalion, but it seems weird that all the junior officers would be sharing an identical mood. The German CO was very happy and buffed his opinion to 2, but the men’s enthusiasm for the kicking they’d given the British was tempered by their own high casualties and they stay on zero. The German platoon commander goes from “Happy” to “Affable”, giving a +1 bonus next time his platoon fights. Attacking through open ground is a viable tactic if you’ve got heavy weapons backing you up. They’ll enjoy the open lines of fire. Being aggressive and attacking hard can really pay off in a probe. The defender can’t afford not to deploy if you get within a couple of feet of his baseline. How do you find time to take all the great photos? I bring my camera, all is set-up but then I get so involved I usually forget to take any photos except one of the initial table set-up. I have a lot of those but none of the action. I often get lots of photos of the early stages, then as things get busy later on I forget! But basically I’ve developed a bit of a habit of always taking snaps during my opponent’s phase. I do need to start using a mini tripod though, some have been super blurry the last few games. Cracking write up as usual Andy, a standard we all should be aspiring to but it takes me long enough to do mine the way I do! Unfortunately for you Phil didn’t manage to muck things up the way I did (twice!). Just a quick point: You only have to track the CO and Men’s opinion if you are the Brits, the Germans have to do everything for each of their platoons. A subtle way of making it more difficult for the Germans as time goes on. Well, I was going to reroll for the platoon commander each time the Brits get a fresh platoon. It probably won’t make much difference, but might inject a bit of flavour. I know you answered this for someone before, but I couldn’t find it. What program do you use to get the animation you use on your maps of the action? If I miss the photos as least I could do those. I cheat. They’re just still images. I capture screenshots of the “table” in Battle Chronicler, then when you play them as a “slideshow” type gallery in WordPress it makes it appear animated. Great report, where did you get the burned out truck? It’s a nice model. It’s from Anyscale Models. Cheap, too! Hi, I’m just about to take this on as British, and was wondering about your chosen support. I show a roadblock as list 2 and the 6lber as list 5 for 7 support points. Am I out of date or missing something? Greg, we use the updated support costs from the CoCulator, which you can find on the Consolidated Arsenal. I’m not quite sure why Rich keeps publishing the old pre-CoCulator costs in his PSCs, since he released the CoCulator himself! The updated cost for the 6pdr is list 4. Thanks Andy, good to know. Especially as this campaign seems near impossible for the Brits. Attacked from both sides of a 6 map board, 2 MG42s per squad and Tiger’s vs PIATs! Bah! I don’t know how I let myself get talked into it! It’s a tough one for the Brits, for sure. Don’t expect to win many games, but the good news is you don’t have to. With your Wild card you only need to win a couple of games to have Jerry on the ropes. Your objective for the first few games is just to delay then and avoid casualties. A winning draw would be a great result in the early games. Why am I avoiding casualties when I get a fresh platoon each game? Just to control the men’s opinion? Yes, exactly. Men’s opinion directly affects force morale so it’s a big deal. The campaign is long enough that we found it a real issue in later games. Starting on 8 or 9 morale every game makes life hard, especially if you’re counter-attacking.